Home » News » New Start for Shaw? Luke Shaw burst into the Premier League in 2011, straight out of Southampton football club’s youth team, and took to first team football and England’s top division with aplomb and outstanding play – he was the talented teenager everyone associated with the Premier League was talking about. Starting in Southampton’s academy, The Saints then first team manager said Luke Shaw ‘was a big part of their future plans’. Signing professionally for the club in 2012, he went onto make 28 appearances for Southampton during the 2012/13 season, his performances for a youngster were very impressive, at the age of 17, Shaw was making the left-back position at St Marys his own and working his way to the top of many big clubs wish list. It was during the summer of 2014 that ‘that big club’ came calling for Shaw’s signature, a dream move was on the cards for the young left-back, to Manchester United. Of course, Shaw couldn’t turn down such an incredible chance to play for one of the biggest clubs in the world, and United’s then new manager. Louis Van Gaal wanted to make the Southampton player a star at Old Trafford. So on 27th June 2014 Luke Shaw signed on the dotted line and became a Manchester United footballer for around £30million. Solid performances saw Shaw’s first season at United go well, however, now established with a year’s experience at Old Trafford, it was his second season that started with so much promise, but injury struck, a broken leg in a Champion’s league group match, and Shaw’s excellent start to the season was over, he would not play again for United until August 2016. It appeared that injury, combined with a change in management, and, the reality of the step-up to one of the biggest clubs in the world, saw Shaw’s Manchester United career grind to a halt. His limited performances declined, his training and exercise regime was questioned by the media and new manager Jose Mourinho, hence him being omitted from the team and being left out in the cold. 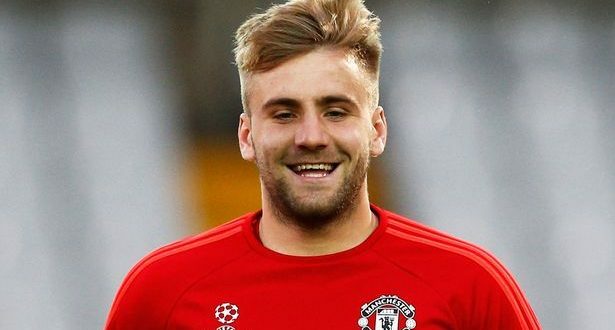 From being branded one of the most promising and talented England players of the future, Shaw’s career nose-dived, and his days at United appeared over especially after his manager publicly criticised him after his below-par performances in the team at times during last season. So is Luke Shaw’s time with The Red Devils really coming to an end? Or is there some light at the end of the Old Trafford tunnel after all? No chance of competing in the world cup and the possibility of not being offered a new contract at United, ironically, seems to have given Shaw the motivation to show Mourinho he wants to make it at Old Trafford and put the required effort into succeeding. Taking on a new in depth fitness programme during the summer, Shaw admits to receiving uplifting texts from his manager boosting his morale and chances of getting back into the team. Impressed by the former Southampton players efforts, Mourinho rewarded Shaw with first team starts in the opening three games of United’s USA pre-season tour in which he looked refreshed, fitter, confident and an improvement in his all round play was evident – could this season be a new start for Shaw? Will his improved fitness, confidence and buoyant mood to succeed after a boost from his manager feel like a brand new signing for United? It could work out well for both parties or it could be the calm before a storm that will see Shaw’s hard work fail, however, there are more positives on both sides than negative hinting that success rather than failure is on the cards. A good run in the side and the chance to make the United left-back position his own, and anything is possible for Shaw. He certainly has the ability and with all his hard work, determination and desire to prove he can play on the big stage, Luke Shaw has already shown the main attributes to succeed at a club like Manchester United. It really could be a new, successful start for Shaw this season and a chance to salvage his Old Trafford career.